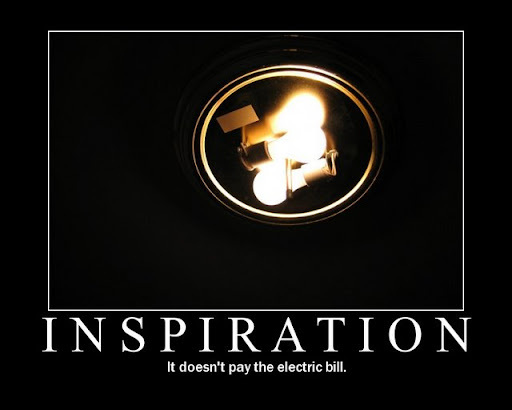 Some of you guys are taking the whole "being inspired" thing too seriously. The whole point of being inspired is so you can then go out and create. Some of you are making "being inspired" the end goal. A purpose all by itself. The same is true of "perpetual students". Students that learn for the sake of learning. They never graduate. They just stay in school and keep taking classes. Of course there is nothing wrong with that as long as you're not in debt up to your eyeballs. But when all you're doing is learning but not producing/creating anything with the knowledge you've acquired, I fear you've failed the point of learning. You learn so you can do. I understand what you are saying but why would you have your own images build around circumstances that happen outside your own free will? In other words why let other people influence your work as it is your work! I mean isn’t it the photographer who is the artist and follows his feeling and evolves around himself trying to find his own way, rather than letting other people have an effect on your work? Let me explain myself, my mother is a painter and has been all her life she is actually pretty famous in her area of expertise, watercolour. When I was a kid she painted winter landscapes and this sold like it was for free they were hot, and people loved them all around. I told my mom to start painting more winter landscapes this was what people wanted to see... She said I don’t want to paint what people want to see I want to follow my own road to wherever it leads because it is my road to travel. I want to do what I like to do it is my passion not anyone else’s! I think that’s when I realised my mom was an artist. 1. Trying to validate my career choice by making more money than I did at my previous job. 2. Realizing that a model's willingness to collaborate could trump her absolute look. 3. Obsessing over perfecting skin. 4. Getting yelled at by agents at modeling agencies. 8. Getting backed up on edits and trying to cut down on edits. After reading the article - a number of times today - I thought I'd comment if I may. I've done two workshops with you, and probably close to ten workshops total. I've vowed to stop doing workshops. Ill explain later. To be honest I've walked away from your workshops and others very disheartened - but never at you; but because I didn't make the most of those moments. Sometimes I'm too nice to others, I don't push harder to get the image i see, I put a wall up, I lack confidence in front of others, I tire quickly because I stupidly fly to the events without rest. I walk in with a preconceived notion, I focus on one aspect, and neglect the bigger picture..I.. I.. I make excuses. And no workshop image will ever really make me feel complete - because it's not really mine, not completely. But it's a stepping stone. In the same way, mimicking someone's style is not me. Granted I gravitate toward certain aspects, certain styles. But the truth be known - my photography doesn't not resemble me - or the best of me. It's a watered down version because I'm mimicking others and I lost me along life's journey. I became something others expected, but never good enough. I lack the confidence - the truth of me. There's a point you really need to stop chasing and make a stand. Charles, you freely give all the information - but many times the student may not know himself / herself well enough to be asking the right questions for them. On more than 1 private workshop I have disappointed my workshop photographer/student. They always say the same thing. "I keep waiting for you to show me that one thing that you do that makes your pictures the way they look"
Am I pulling punches? Am I afraid to give away the secret sauce? Am I hiding the magic bullet?